The match was roughly even with Western United getting better control in the first half and the second half was certainly in the hands of KOSSA who repeatedly broke through their opponent’s defences but could not find the goals that were required. Ball possession changed rapidly in the opening minutes but it was James Egeta who opened up shooting after 3 minutes after Nicholas Muri flicked a pass over the Western United defenders and he connected with the ball well but his shot went wide. Western United took the lead after just six (6) through an own goal by Tome Faisi who mistakenly sent the ball towards his own net while trying to deal with a cross from Hickley Rence who also had some claim to the goal. KOSSA pushed Western United back into their own half after their goal but good work from Leonard Rokoto in the midfield kept the balance level as his side sought to prevent the ball going past the halfway mark and towards their defenders. Western United struck again in the 13th minute through Himson Teleda who got on to the end of a Hickley Rence cross and sending the ball home with a well struck half volley from just outside the KOSSA 6-yard box. 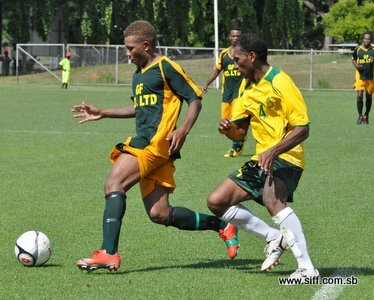 Halfway through the first half KOSSA found themselves 3 – 0 down when Coleman Makau scores following an individual run set up by Rokoto on a counterattack but they regrouped strongly to score in the 32nd minute with a header from Clifford Wate to leave the field for the break with a 3 – 1 score line. KOSSA returned with passion in the second half and it was Western United’s time to be pushed to the limit as they found their way past the defenders with ease and Felix Ray Jnr. was kept busy dealing with corner kicks and free kicks until the final whistle. Their pressure earned them a penalty at the hour mark but the opportunity was squandered as Egeta sent the ball directly towards where Ray Jnr. was heading and he was able to flick over the cross bar to safety. Substitute Michael Misitana made the right impact for KOSSA when he came in scoring in the 78th minute to draw the score line to 3 – 2 and almost made it level with Western United a few minutes later but put too much to his shot and it went over the cross bar. Muri brought KOSSA close again to levelling the scores with 5 minutes left on the clock when he followed up a corner kick with a powerful shot but it ricocheted off a Western United defender before going out for another corner kick which was intercepted by Ray Jnr. Two (2) minutes of stoppage time were added to the game but Western United held their nerves to finish off with a win and the 3 points which take them to the top of the Telekom S-League table which they will occupy at least until Koloale take on Malaita Kingz on Thursday.